Lyonel Feininger, Bauhaus, March 26, 1929. Gelatin silver print. Harvard/Busch-Reisinger Museum. “The ultimate aim of all artistic activity is the building! Let us desire, conceive, and create the new building of the future together. 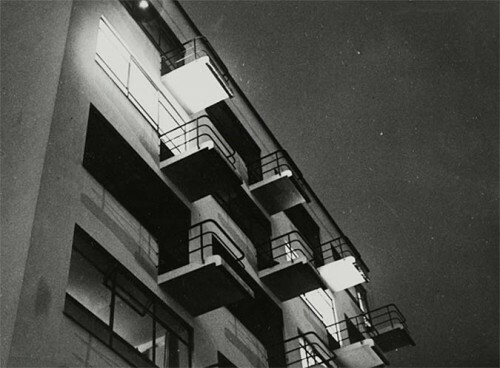 . . [and it] will one day rise towards the heavens from the hands of a million workers as the crystalline symbol of a new and coming faith,” Walter Gropius boldly declared in his 1919 “Bauhaus Manifesto,” laying the foundations for a new architecture and a modern approach to design. Seeking to reunite the artist and artisan together, the founders of the Bauhaus looked to medieval guilds as a model for a new design school that would combine the arts and design under one roof. 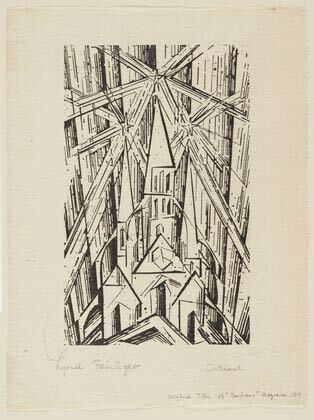 To illustrate the manifesto, Gropius selected a woodcut by American-born German artist Lyonel Feininger, titled, “Cathedral,” an abstracted depiction of a late Gothic church. This collaboration marked Lyonel Feininger’s first involvement with the Bauhaus—he would be later hired to teach printmaking—that would continue until the school was closed under pressure from the Nazis in 1933. 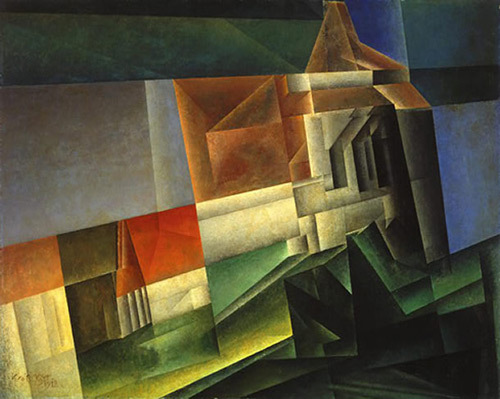 Lyonel Feininger, Cathedral (Kathedrale) for Program of the State Bauhaus in Weimar, 1919. Woodcut. MoMA. Until October 16th, “Cathedral” is on display at the Whitney Museum of American Art as part of the retrospective, Lyonel Feininger: At the Edge of the World. It is the first show in the U.S. to include the full range of Feininger’s work. The exhibit begins with his whimsical street scenes filled with bright, saturated colors; there are also his Chicago Tribune “Kin-der-Kids” comics, his black and white photographs of the Bauhaus, hand-carved miniature buildings, and his prism-like, Cubist inspired portrayals of towns and seascapes. At the Edge of the World captures the expansive diversity of Feininger’s German and American subjects, formal expression, and mediums. The exhibit design is simple and fluid, if conventional for a contemporary retrospective: Feininger’s work is organized chronologically rather than thematically, arranged on white walls, with ample breathing space between pieces. A 1925 Time magazine review of a “Blue Four” exhibition in Manhattan, which included Feininger’s work alongside Alexej von Jawlensky, Wassily Kandinsky, and Paul Klee, straightforwardly declared that in modern art, “Artists should put down lines, lay on colors, with the simple purpose of giving the eyes an adventure.” The Whitney succeeds in conveying the exciting experimentation between art and design, so central to Feininger’s work and the Bauhaus vision. Lyonel Feiniger, Zirchow VII, 1918, National Gallery of Art.